1) After reading last week's Quick Takes, Drama Queen informed me I am obsessed with farting and poop. In my defense, I can only use the fodder they supply, right? Ladies Man: Hey Dad, we need to stay up late tonight to see if the government shuts down. It was a nice try, but his father wasn't buying it. Kevin: There may be a government shutdown, but there's not a parental shutdown. We are still functioning. We're still in control. He said it with authority and all, but there are some days I wonder. Just sayin'. 3) Good luck to Drummer Boy and DOJO Percussion from Omaha, NE as they compete in the WGI World Championships in Dayton, OH this weekend. This group has worked HARD, spending nearly every weekend since November putting this show together. As promised, I finally have a clip. It's impossible to tell you exactly where Drummer Boy is as he moves around so quickly and the faces are so far away, but if you look really closely, he's the only snare player with a beard (which according to Drama Queen is becoming quite the attraction for the ladies). Drummer Boy talked about dying his beard purple and silver to match their costumes. I'm hoping it doesn't happen as we'll be taking pictures for the church directory the following week! 4) Ladies Man was being loud, goofy, generally acting out, doing anything he could to avoid his homework (GRRRR). Though often this brings roars from his sister encouraging his inane behavior, this night Drama Queen was not in the mood. Drama Queen to Ladies Man: Why are you so dumb? Ladies Man: It's because you haven't been a good role model. Miss Innocent One sat quietly watching the scene as she often does, but this time piped in, surprising us all. Miss Innocent One in a thoughtful tone to Drama Queen: Actually, that's a valid question. 5) Believe it or not, I finally, finally, FINALLY got my new, wonderful, splendiferous office painted. I know the bright red is not everyone's cup of tea. I mean, I saw the look of shock in my mother-in-law's face when she saw it, but I love it. You can't see it from this photo (Do you know how hard it is to take a good picture of a small room?! ), but the adjacent walls are painted antique white with a gold glaze sponged over top, giving them a little shimmer. Kevin says that at night there's a glow that comes from the room. I like to think of it as luminescence from divine inspiration. Come on. Humor me. I am super excited that Ladies Man will be painting a large print to go smack dab in the middle of that red wall. He's showed me some sketches I love. It will be awesome. 6) I have had a productive week, people. Not only did I get my office painted, but since everything is in place there, I started cleaning out some cabinets downstairs, bringing books up to make my new haven beautiful AND functional. So in my quest to never be an episode of Hoarders, I managed to clean out a dining room cabinet, clear some shelf space in our old office and found time to get rid of outdated food in my freezer. Wow, who has lit a fire under me?! I even ran five miles one day (Never mind that it took two days to recover from it.). Do you think I need to lay off the caffeine? Hmmm. 7) We're looking forward to a fun weekend. Today we're headed up the road a patch to watch Drama Queen and Ladies Man perform at District Music Contest. Tonight we're going to a Michael W. Smith concert. Tomorrow we're home all day (Can you believe it? Two Saturdays in a row!) and then off to dinner with friends in the evening. It will be glorious. I am a happy, happy girl. I hope your weekend trips your trigger too. 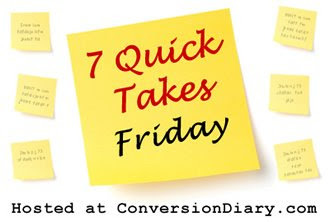 Start the fun by reading more Quick Takes at Conversion Diary.